Every year, Unicorn unveil the latest in cutting edge darts technology, having been at the forefront of darts innovation for over 80 years. The 2019 product launch was no different. Despite forewarning FIFA that a far more important and prestigious event was taking place on the same day as the World Cup’s opening match, it seems as though the message fell on deaf ears. Nonetheless, Sales Director Richard Lowy began the day with a short presentation in the theme of the World Cup to thank everyone for attending. 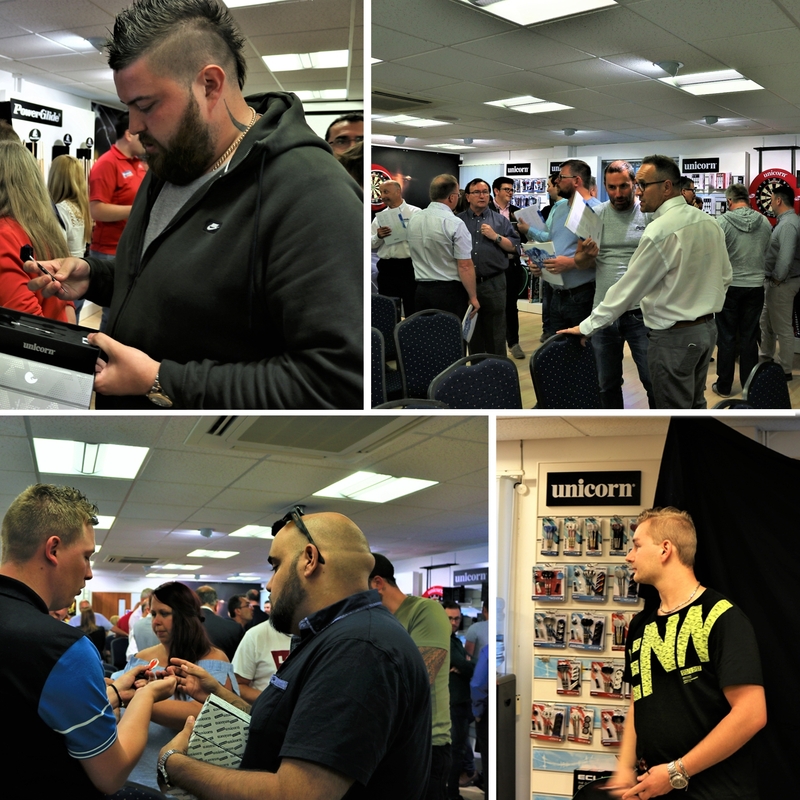 The presentation highlighted the global reach of darts, demonstrated just by those in attendance, with trade partners and players coming from across the world to see the latest Unicorn offerings. 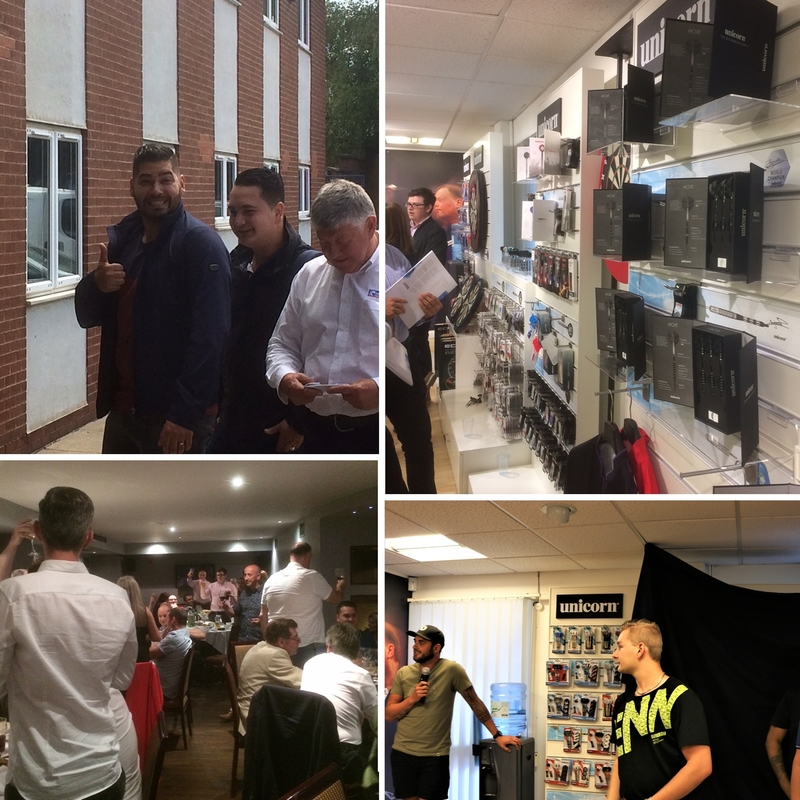 As usual, the launch was attended by a number of Unicorn players including Jelle Klaasen, James Wade, Joe Cullen, Kyle Anderson, Kim Huybrechts, Michael Smith, Ian White, Keegan Brown, Dmitri van den Bergh and Unicorn’s latest signing, Jeffrey de Zwaan. The afternoon was punctuated by a game of 47 (or 87 for the pros), a game so simple even the pros struggled. 3 darts, get as close as you can to 47, no need for a double. It sounds easy, but with the watchful eyes from a crowd full of darts aficionados, I can assure you a dart board has never looked so small. With the chance to win best male, female and member of staff up for grabs, the audience came alive. Unfortunately in my case, effort seemed to far outweigh talent. I don’t see an appearance at Alexandra Palace in my future (or wildest dreams for that matter). Thankfully, some order was restored with the pros game of 87, with the players buoyed by the thought of bettering one another. In front of a raucous audience, led by Managing Director Edward Lowy’s chants of ‘stand up if you love the darts’ (disclaimer: that last part may not be true), it came down to a tense play-off match with rising star Dimitri van den Bergh emerging victorious, winning arguably the most important trophy in darts. Though the chanting may not have happened, what is true, however, is that Unicorn has been ‘The Big Name In Darts’ since 1937 and continues to be exposed globally on TV for more than 6,000 hours each year. It’s easy to see why when you look at how this year’s range continues to lead the way for others to follow with their innovative designs and staggering attention to detail. The star of the show this year was the introduction of the ‘Noir’ range. The Noir is a range of darts that epitomises class and style, complete with laser engraved player signatures and the Unicorn hallmark. Unicorn prides itself on making available to the public the exact same dart that your favourite players use, a trend that continues across the board with each Player Edition dart sets in the 2019 range. The unveiling of the Noir range was complimented with a matching range of ‘Natural’ darts which, when presented by Richard Lowy, was suitably supported by Michael Jackson’s song ‘Black or White’. There was also much excitement this year with the official unveiling of Seigo Asada’s brand new set of Unicorn darts, both Soft and Steel Tip. Asada is Japan’s No.1 soft-tip player and already a superstar in his homeland. This year, he announced himself on the world stage with an impressive performance in the 2018 PDC World Cup of Darts. Known as ‘The Ninja’, he won the Japanese Championship for a 4th consecutive year to earn his spot at the World Championship. 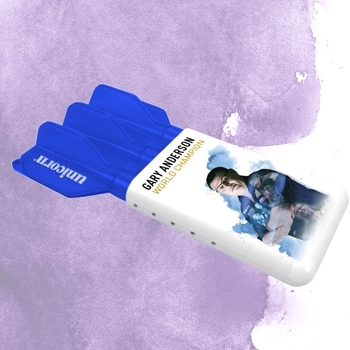 In addition to the darts themselves, customers will also receive a stunning Deluxe Player Edition Presentation Box for both the Natural and the Noir range of Gary Anderson’s World Champion Phase 3 darts, Jelle Klaasen’s World Champion darts and Seigo Asada’s Maestro darts. The Presentation Box is available with both the Steel Tip and Soft Tip versions of the aforementioned sets of darts. 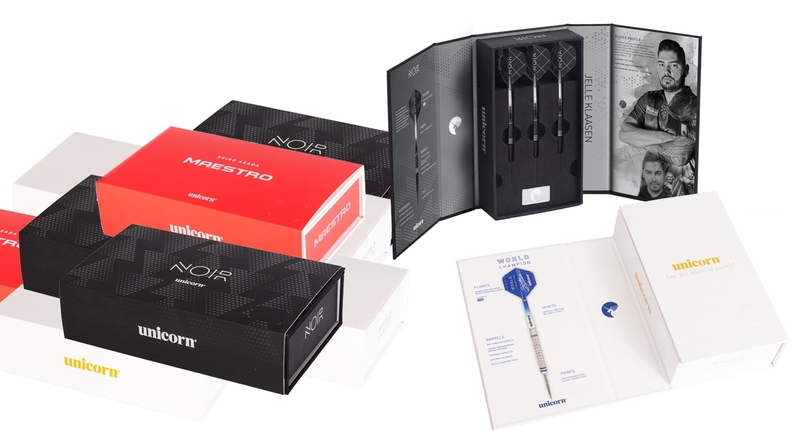 Presentation Boxes are also sold with the Noir Range of darts used by James Wade, Michael Smith and Kim Huybrechts, all of which contain information about the dart itself and the player who uses it. Unicorn’s extensive range of flights has grown larger this year with the introduction of ‘ULTRAFLY’. Utilising cutting edge materials and manufacturing, Unicorn have created their most visually stunning and durable flights ever. 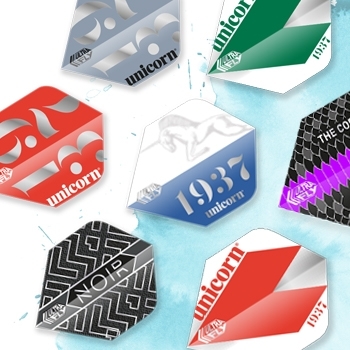 In addition to the current range, there are four brand new player flights; Gary Anderson, Jelle Klaasen, Seigo Asada and Joe Cullen, three versions of the Noir flights, four versions of the Origins flights, four Icon flights and four Silver Comet flights, which pays homage to the Godfather of all darts, the 1937 Silver Comet. Also unveiled were a number of accessories, including three brand new shirts to be worn by Jelle Klaasen, Joe Cullen and Devon Petersen. Klaasen’s more subtle ‘ultra-light breathable lycra/polyester blend’ was a personal highlight, but the louder, brasher shirts worn by Cullen and Petersen are impossible to overlook. This year, Petersen has evolved from the Spartan Warrior to the African Warrior which is certainly reflected in his new shirt. Another highlight was the Slider Dart Case which features a brand new design, able to fit 4 lengths of darts, fits any size flights and slides to fit the length of your darts. It is also available in three designs, Gary Anderson, Seigo Asada and Clear whilst remaining small enough to fit in your pocket. Jeffrey de Zwaan is a fantastic new addition to Unicorn, but unfortunately he signed the dotted line too close to the launch date to have his range of darts made available having only joined in May. Make sure you follow Unicorn on social media to hear news of when his very own dart will be available to purchase. 2019 not only promises to be an important year for Unicorn, it promises to be a marquee year for the PDC who have announced that the World Championship will grow to include 96 competitors, giving Unicorn another chance to shine on the world stage, with every dart thrown live on SKY TV and terrestrial channels using the HD2 Pro Edition dartboards. So why choose Unicorn? Well if you’re still undecided it might help to be reminded that Unicorn Players using Unicorn darts have won more World Championships than any other brand - 20 and counting! Unicorn also invest back into the sport with the PDC Unicorn Challenge Tour, Development Tour, Youth World Championships and Unicorn Next Generation, creating aspirational opportunities for tomorrow’s stars.